Thanks to technology and innovation in the flooring and 3D printing sectors, revolutionary opportunities are available to architects, interior designers, manufacturers, specifiers and clients. To stimulate innovation, the US now offers R&D tax credits to stimulate further growth in these sectors. “In America, technology and experimentation are encouraged because of the Federal Research and Development Tax Credit, which ranges from 4% – 7% of eligible spending for new and improved products and processes. Even if South African businesses can’t directly benefit from these tax deductions, new technology and products in the flooring market continue to uplift the global industry as a whole,” says Roxanne Mancini, Editor of FLOORS in Africa magazine. A number of companies are experimenting with flooring products and 3D printing. Although still in its infancy, vinyl and linoleum flooring can be designed and 3D printed, for example. Manufacturer of polymer additives, Chemson, has also developed the world’s first polyvinyl chloride (PVC) filament for 3D printing. PVC is a popular flooring option because of its recyclability, cost-effectiveness and longevity. Combining 3D printed flooring with PVC is helping designers create innovative flooring that is also fireproof, weatherproof and UV-resistant. A San Francisco-based company called Emerging Objects is currently researching how to print in 3D using materials such as salt, concrete, wood, ceramic and rubber. The company also has a vested interest in powder printing technologies and developing new 3D printable materials. It has since created building tiles that can insulate a building, aid in water collection, absorb sound and allow for integrated sensors. “We saw a limitation in what a machine can make because of the medium, and so we wondered if we could reformulate that media to suit our own architectural agendas to print big,” said Emerging Objects Co-Founder, Ronald Rael. 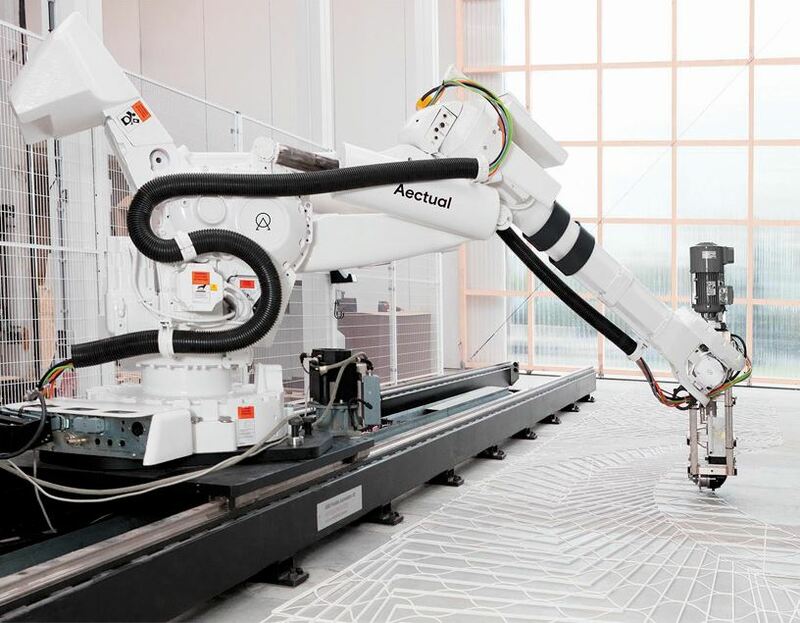 A company called Aectual is manufacturing sustainable 3D printed terrazzo floors. A marble or granite composite mixture is poured into a recycled bio-plastic material frame to create the tiles, leading to a zero-waste process. The tiles are ideal for spaces that need to withstand heavy foot traffic, such as museums, airports and retail spaces. A company that specialises in sustainable cladding for walls, ceilings and floors, Durmaplast, has also started producing water-resistant flooring that can withstand extreme humidity as an alternative to traditional laminate or LVT flooring. Their product, called Finesses floor, is an innovative concept of modular flooring that combines the benefits of laminate and vinyl with 3D printing. “In the past, the main benefit of 3D printing was customisation, but today flooring manufacturers are using this technology for complete process improvement which is fascinating and will continue to provide more benefits to the client and end user,” says Roxanne. Acknowledgement and thanks are given to www.3dprint.com, and Charles Goulding and his team from R&D Tax Savers (www.rdtaxsavers.com) for the information contained in this article.